The first step to starting seeds indoors is to fill a container with sterile soil mix within one-half inch of the rim of your seed flat or other container. Thoroughly water the soil-less mix in the seed tray and allow it to drain. Tamp down the soil lightly to firm it with your hand or a board. Place two or three seeds in each container or cell to be thinned later to one plant. Carefully sprinkle one-quarter inch of soil-less mix evenly on the surface and tamp down to ensure good contact between seed and soil. Using lukewarm water, spray or gently water the soil surface until thoroughly wetted and fill the water reservoirs if you have them. Cover the seed trays or containers with the plastic lid, plastic wrap, glass or newspaper but don't allow the cover to rest on the soil surface. Place the seed container in a location where the temperature is 75 to 85 degrees F for fastest germination. A soil thermometer is handy for this. If your location is too cool you can place the tray on top of a water heater or refrigerator. I use an electric seed-propagation mat, which is a heated rubber mat which I place directly under the tray. Another option to warm the containers from below is to use heat tape or cables which you can buy at garden supply stores or online. Check daily until the seeds germinate. If the soil appears dry, gently water using lukewarm water and refill the reservoirs. After one fourth of the seeds germinate, usually seven to ten days, move the tray to a natural light location or under fluorescent lights for 16 hours per day. I have two favorite online sources for seed germinating supplies. Burpee, the well-known seed company, not surprisingly sells seed trays and other related equipment in addition to seeds. Items include the Burpee Ultimate Growing System , a 72-cell seed tray that also includes a wicking mat, clear plastic top, soil blocks, and labels. 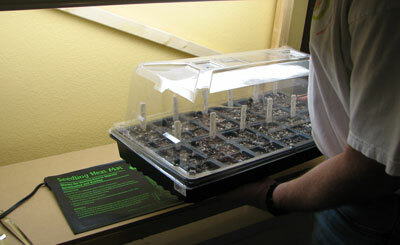 They also carry a seedling tray heat mat that has received good customer reviews. Another company is Gardener's Supply Company. Like Burpee, they show actual customer comments on all their products. They have a kit called the APS Starter Kit which includes everything you need to start seeds indoors, including two self-watering 24-cell seed trays, two greenhouse covers for faster germination, 9 quarts of germinating mix, 24 wooden seedling markers, two water-level indicators, and fertilizer for seedlings.